Alone Time: Not Jackson’s Hobbit | SPACE-BIFF! 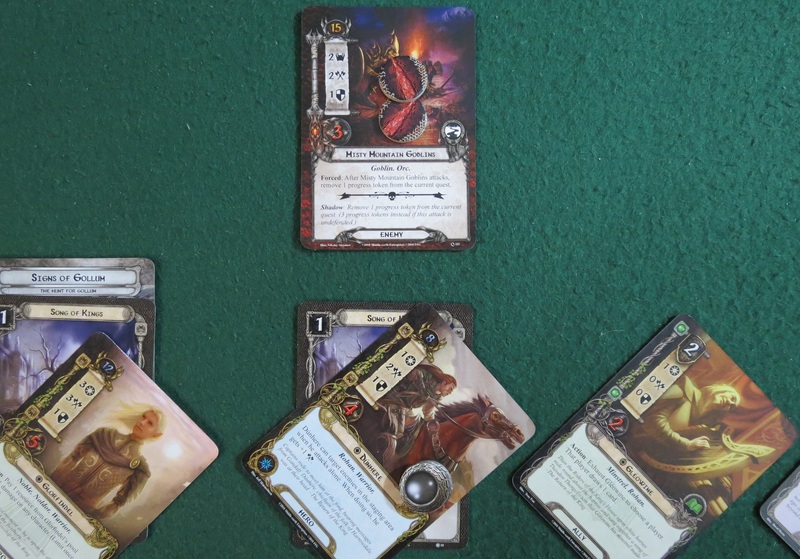 Although it’s highlighted some pretty exciting adventure games, today Alone Time is going to outdo itself — and not only by talking about itself in the third person; rather, by introducing you to The Lord of the Rings: The Card Game from Fantasy Flight Games! More than being merely a great two-player game (and theoretically more, though more than two makes it as boggy as the Dead Marshes in late April — pardon me, Thrimidge by Shire reckoning), TLotR:TCG is also an absolutely fantastic solo game. What’s more, it’s so expansive that it blurs the line between game and hobby. Three heroes accept the quest. Before we begin, let me make a quick clarification: when I say “expansive,” I don’t mean it covers a lot of ground. Oh, it does that too, considering it’s got all of J.R.R. Tolkien’s wide and fascinating world to draw upon, but what I really mean is that there are a ton of ways to expand it. The basic set comes with well enough to keep anyone enthralled for days: twelve heroes, four starter decks, and three big quests that play differently each time. You could buy just this one set and be content without ever knowing expansions exist. Still, it’s nice to know once you’ve finished up with those, there are piles of single-quest expansions that also pack extra heroes and cards to swap into your decks, not to mention even larger expansions that give you gobs of everything. 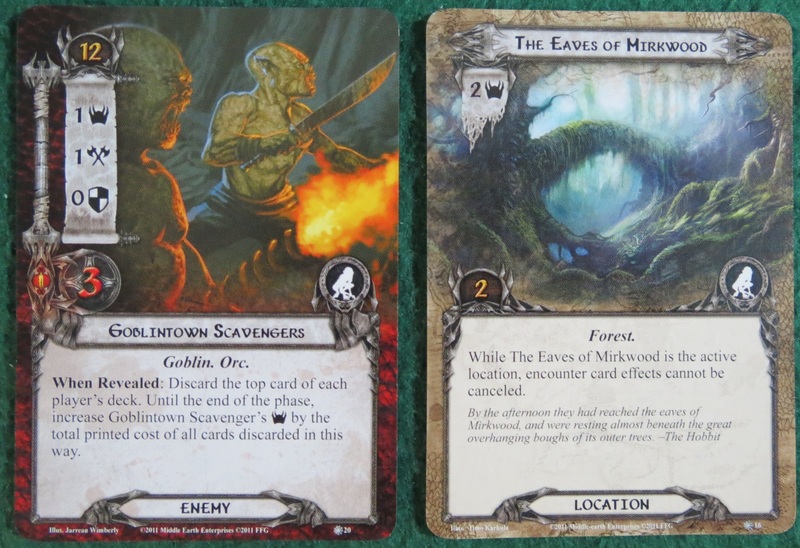 The result is that the Lord of the Rings Card Game could be the only solo adventure game you’ll ever need, provided you’re fine buying new quests and expansions now and then. And if you’re wondering how diverse all these different quests and cards and heroes and whatnot could possibly be, today I’m going to walk you through my most recent solo adventure. In this case, the quest takes place between the events of The Hobbit and the trilogy itself. Gandalf has called upon three unlikely heroes to form a micro-fellowship tasked with a mission of utmost importance and secrecy. Foremost is Bilbo Baggins, apocryphally brought out of retirement for his resourcefulness and also because the Shire has become boring and unsatisfying after his adventures to the east. He’s joined by the much-debated elf Glorfindel, who nobody is sure whether is one person or two; and Dúnhere, whose main claim to fame is that he’s going to die at Pelennor Fields in a decade or two (spoiler alert). Now, cool theme and familiar faces aside, I’m already playing the game, and I haven’t even begun the quest proper — instead, I’m building a deck, picking heroes, making decisions and fighting self-doubts, and double- and triple-checking everything to make sure the balance is just right. In this case, I’m bringing resourceful Bilbo because he lets me draw an additional card during the resource phase, doubling my card options. Glorfindel is able to heal my heroes and allies, and Dúnhere is a versatile fighter. My deck itself is built from Lore and Leadership cards, meaning it focuses on boosting my heroes and on attracting allies to help on my quest. The really complicated part is that this doesn’t immediately look like a good idea. 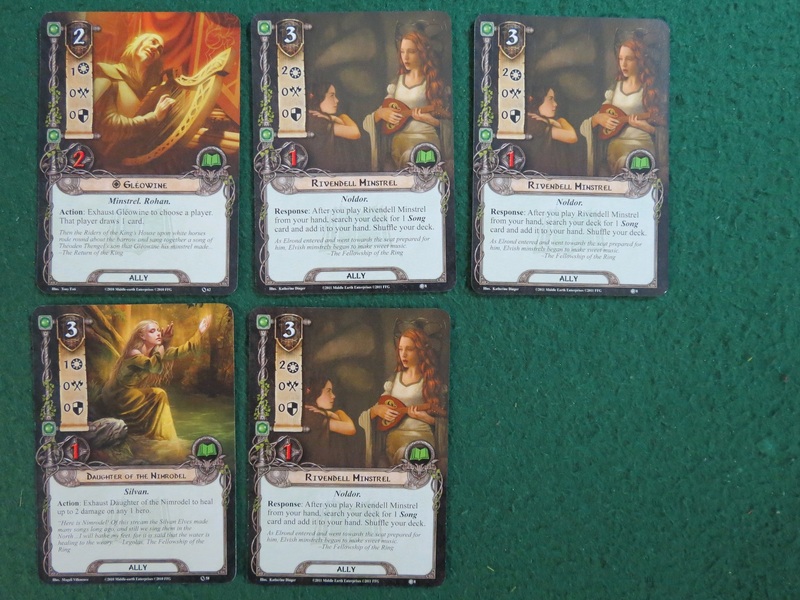 See, Bilbo and Glorfindel are Lore heroes, meaning they can purchase Lore cards from my hand. Dúnhere, on the other hand, doesn’t represent Leadership — he’s a Spirit kind of guy. I could have included a Leadership hero instead, but I’m partial to Dúnhere, so I’ve included him and then added some “Songs of Kings” cards to my deck in the hopes that I’ll be able to teach him how to lead. Of course, the chances of drawing one of these three cards out of a deck of 50 is pretty low, so I’ve also included some Rivendell Minstrels. These allies aren’t the best to bring to a fight, but they let me search my deck for a “Song” card when they come into play, making it a lot more likely that I’ll be able to train Dúnhere into my ideal hero. This is just one of many little considerations that go into the creation of a solid deck. The quest begins along the Anduin. On to the quest itself! This time, Gandalf has tasked us with searching for signs of the creature Gollum. It’s likely he’s located in the Anduin Valley between the Misty Mountains and Mirkwood Forest — a wide, dangerous region. And in the case of this scenario, the important part is that it’s big. Expansive, even. See, one of this game’s biggest strengths is that the scenarios are completely distinct. Where the base game’s three quests see you dodging spiders and cutting your way through webs in Mirkwood, using boats to blaze past hunter orcs on the shore of the Anduin, or creeping through the bowels of Dol Guldur on a daring rescue mission, this particular quest is about exploring a vast countryside populated by a smattering of intermittent threats rather than worrying about loads of direct combat. Danger usually arises from the environment itself, and less often from the edge of a rusted goblin-sword. Worse, there’s the added concern that they need to figure out Gollum’s location fast — lingering too long in this polluted region will gradually attract the attention of powerful dark forces that can crash the party with little effort. The early opposition isn’t much of a threat. Goblintown Scavengers are no match for our plucky band. The Rohirrim scout delays them while Dúnhere wipes them out. The camp is still safe, for the time being. The journey continues as our group scouts through more locations, eager to keep all those dark forests and vast riverlands from threatening their flanks. 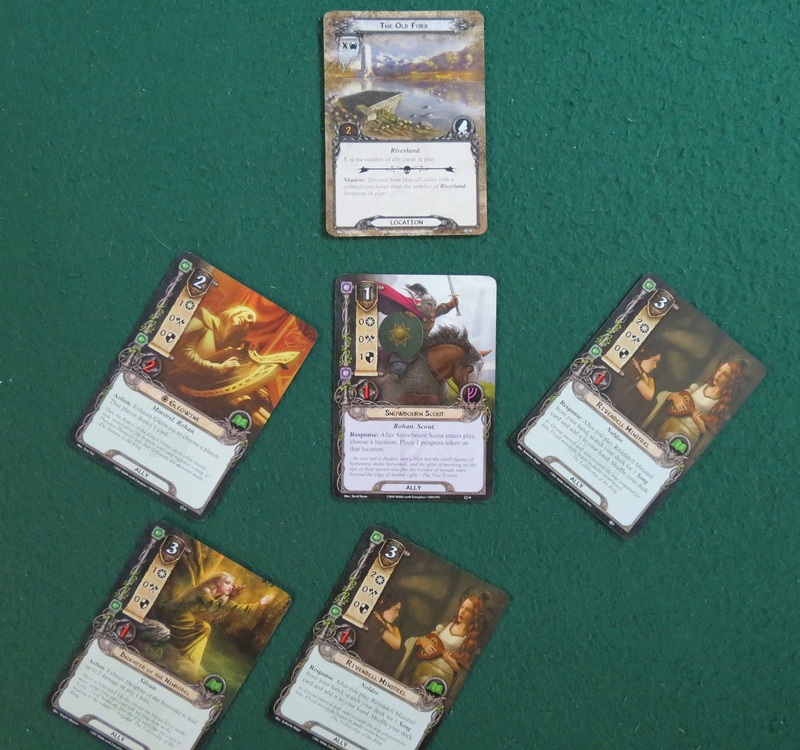 A minstrel from Rivendell shows up to help, singing Dúnhere the Song of Kings to teach him a valuable lesson and give us access to all those Leadership cards we packed into our deck. A flock of Eastern Crows tries to swarm us, though they’re sent back to the encounter deck by a coordinated defense and counterattack. And an elven healer also pledges her support to our noble cause. As our band grows stronger, we’re also growing more desperate — there’s still no trail to follow, and time is running out. Worse, our band stumbles across two delays in quick succession. The first is some goblins that have come down from the Misty Mountains to hunt us. They aren’t much of a threat in combat, but their ability lets them pluck at the tightrope we’re walking. Right now, we can’t afford that plucking. See, unless you have some sort of event card or special ability, you can only use each hero and ally once each turn — and there are a lot of competing ways to make use of them. Not only does it exhaust your guys to defend against enemy attacks, fight back, or take special actions, but you also need to dedicate some of your group every round to “questing.” This represents the resources you’ve spent on scouting, hunting for clues, watching your flanks, exploring new terrain, scavenging for berries, and other general-purpose quest-fulfilling criteria. When you quest, you reveal new encounter cards and compare the Willpower of your questing heroes and allies to the Threat of the cards in the staging area. Threat can be contributed by enemies you haven’t gotten around to battling, terrain you haven’t cleared, and all sorts of other dark treachery. Resolution is simple: if your Willpower total beats the Threat total, you make progress on the current quest or on whatever location you’re currently clearing. If, on the other hand, the Threat beats your Willpower, then your ultimate resource — time — is whittled away, and you come that much closer to absolute defeat. In our case, most of our threats have come from wide unexplored locations, which are best cleared by dedicating lots of people to the questing phase. Since we’ve got all our minstrels and most of our heroes out questing, the appearance of those Misty Mountain Goblins means we don’t have enough soldiers in camp to deal with them. Even worse, these goblins have somehow become so adept at delaying heroes that they remove our progress from quests when they attack. Since it takes us two turns to fully dislodge them, our fellowship is now significantly delayed. At least Bilbo is able to defend against them on his own so none of our people get hurt. Hindered at the old ford. The second delay seems completely benign at first. Just another location along the Anduin. Then I actually read it, and my jaw drops. It’s an Old Ford, narrow and broken. All we need to do is get across, which shouldn’t be any problem at all — except our band of heroes is now quite big, eight people in all. Which means getting across the ford is now our number one priority, since it’s clear we won’t be able to get anything else done until we do. Eventually we make it across, wet and with less time before the local dark lord decides to blast our brains from afar. At least there’s another Rivendell Minstrel over on the other side, just begging to join our group. Between our three elven minstrels, Gléowine, and a singing Daughter of the Nimrodel, we now have the most musical fellowship of all time. And considering this is Tolkien, that’s saying something. The good news is that we’ve finally found some evidence that Gollum has been here — just a small camp, some chewed fish, and a cry of “Precioooous!” on the wind, but we’re reasonably sure we’ve caught his scent. Late opposition nearly stops the chase. Gulp. Unfortunately, our enemies have caught up to us. 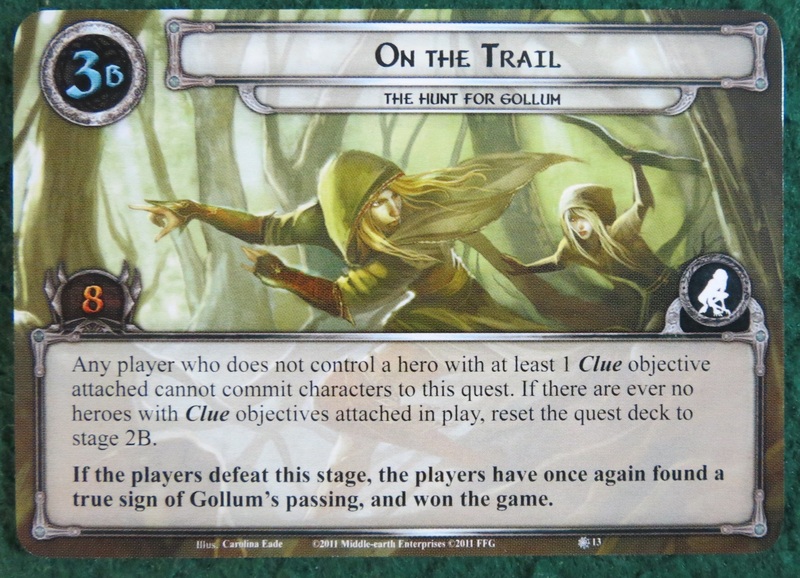 More of those pesky quest-hindering goblins, more swarming crows, and some really terrifying Hunters from Mordor who it turns out are also hunting Gollum, and who are made more powerful because they want our clue — which we’ll lose if the hero carrying it is wounded. 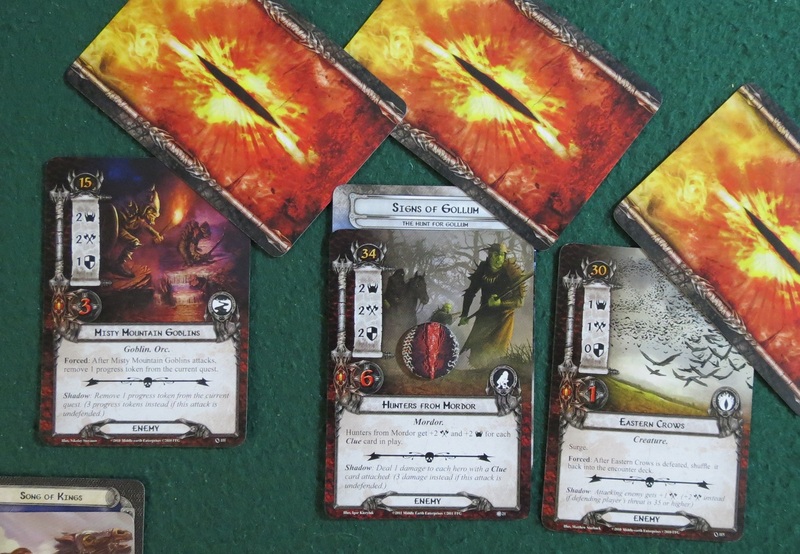 To make matters worse, combat in the Lord of the Rings Card Game isn’t a mere numbers game. Each attacking enemy also has a face-down encounter card placed over it (called a “Shadow” card), which you don’t get to see until you’ve already exhausted heroes for defense. These Shadows can have all sorts of effects, ranging from absolutely nothing to increasing the enemy’s attack to taking progress off of quests to exhausting your defender before he even gets a chance to raise his shield. Gandalf shows up to steal the glory. Thank goodness for Gandalf the Grey, everyone’s favorite last-minute savior! He shows up in the nick of time, acting like a sort of wildcard — he only lasts one round before wandering off again, but his appearance polishes off the Hunters and helps us get rid of the goblins. Nothing else significant appears to block us, and we’re able to escape from the valley. Looking at the threat dial that counts how much time you have before attracting too much enemy attention, we weren’t absurdly close, but it sure wasn’t a walk in the park. 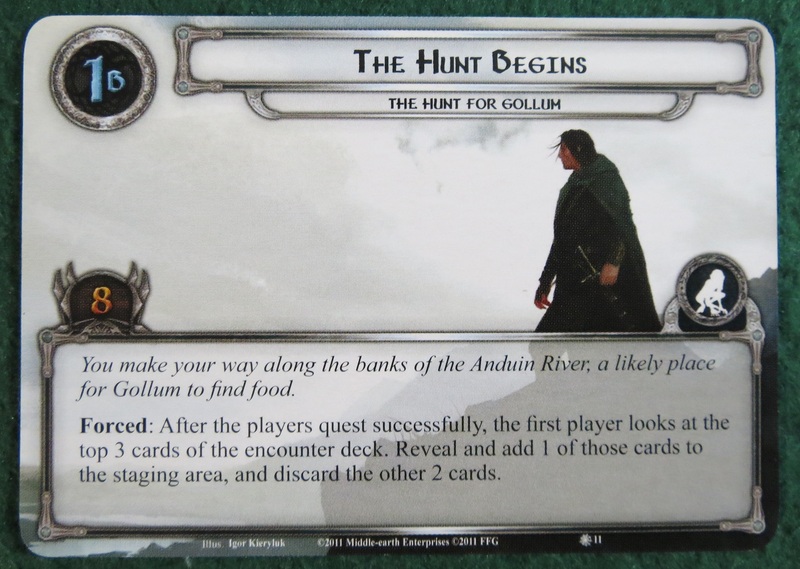 The Lord of the Rings: The Card Game. 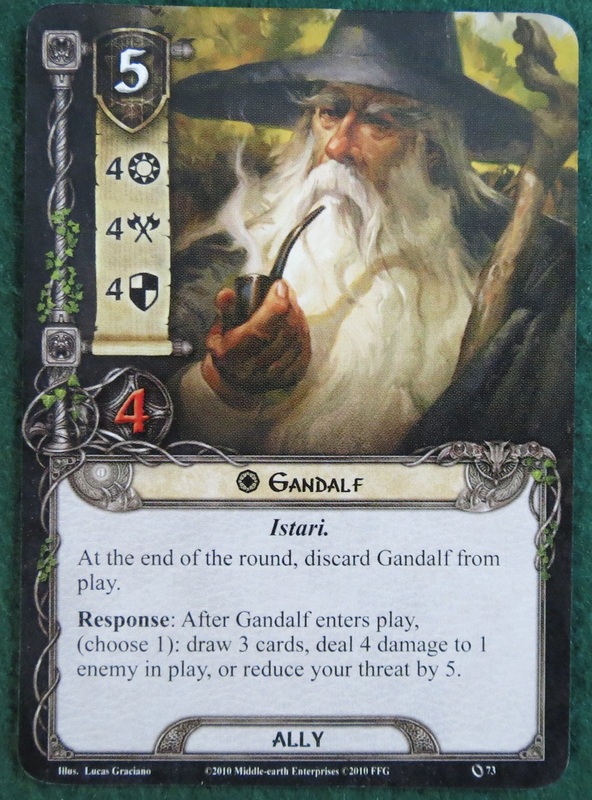 So that’s the Lord of the Rings Card Game. It’s easily one of the deepest, most thematic, varied, and exciting solo games out there. The downside is that most of the scenarios have been tested for two players, meaning there are a couple that just aren’t beatable solo, but there are so many options here — from over thirty official quests and dozens of fan-made adventures — that this really is a negligible point. And a game that’s as easy to play alone as it is to play with your significant other is astoundingly rare. Seriously, get it. I could write ten Alone Time articles just about the adventures I’ve had with this game. Posted on April 19, 2013, in Board Game and tagged Alone Time, Board Games, Fantasy Flight Games, Living Card Game, The Lord of the Rings. Bookmark the permalink. 11 Comments. To be fair, everyone should ALWAYS read the alt-texts. They’re often educational and/or very funny. I hate Dan so much sometimes. Ugh. I’ve only begun playing boardgames seriously with some of these solo games that he recommends. So far I haven’t spent any money because they’ve all been print-and-play games. This will be my first actual purchase. When it comes to my boardgame wishlist, you’re just merciless. Seriously, you’re AT LEAST as bad as SU&SD or Rab Florence. I totally liked Jackson’s Hobbit! I regret NOTHING! You’re a good man, Sarigs. A little misled, but a good man nonetheless. This is one of my favorite games to play with my husband! It’s fun to play with two people, but also just as a single player with the other person revealing cards and reading the text. Let’s go on more adventures together hey okay Dan? We found this deck-build online, made for this particular adventure, and it was really effective—but I’d have loved to see more fun attachments, events, and hard-hitters for battle because I love slaughtering orcs, spiders, and goblins with my honeypants. For when we play again, I’m excited to build our deck(s) to be a bit more exciting! So how many hours does it take to play a solo game? About 45 minutes to a little over an hour if you already have a deck prepared. It’s a pretty quick game. Making a deck can take longer, though the process is usually experimental. So you’ll throw a deck together, play a game, rework your deck a little, play a game, etc. Pingback: Alone Time: Cthulhu Yahtzee | SPACE-BIFF!